Baleària’s Hypatia de Alejandría, the first smart ship powered by LNG that sails in the Mediterranean, recently made its first commercial trip, between Barcelona and Palma. The ferry arrived at the port of Barcelona, ​​coming from Venice, where Cantiere Navale Visentini (the shipyard that built the ship) is located. President of Baleària Adolfo Utor and the president of the Port of Barcelona ​​Mercè Conesa held the first call of the ship in this port which is also committed to reducing emissions and boosting the use of LNG. “The Hypatia of Alexandria marks an important milestone both in the history of Baleària as well as in sailing in the Mediterranean, being the first ferry passenger powered by natural gas that crosses these waters, and it will joined soon by her sister Marie Curie,” said Utor. The shipping company has invested 200 million euros in the construction of these two vessels, an example of innovation and sustainability, which are propelled by dual fuel LNG engines (with a power of 20,600 KW). 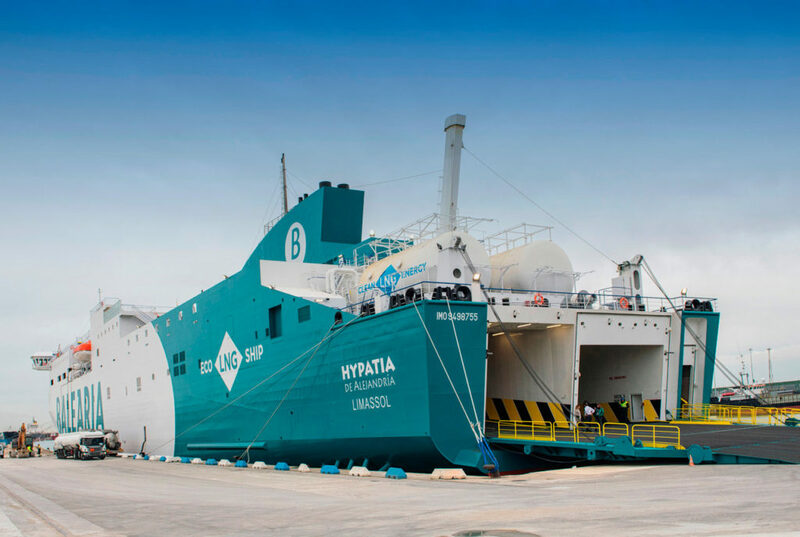 Besides starting a new LNG-driven era in Baleària, Hypatia de Alejandría, is the company’s first smart ship that includes technological innovations at the service of the customer to improve their experience on board. Regarding technical features, the new ferry has 186.5 meters of length and capacity for 880 people, 2,194 linear meters of cargo and 166 vehicles. Smart technology and digitalization not only improve the passenger experience, but are also at the service of energy efficiency. Thus, the ground monitoring of the complete operation of the ship propulsion system is in the process of being implemented, which will ensure that it works optimally, as well as detect and resolve possible incidents at a distance. In addition to Hypatia de Alexandria and her sister Marie Curie, Baleària is building Eleanor Roosevelt, the world’s first passenger and cargo fast ferry with dual fuel engines that use natural gas. In addition, the LNG conversion project of six of its ships has already begun, which will be carried out during two years and that has received a subsidy from the EU. Baleària is one of the main supporters of sustainable shipping transport and a pioneer in the promotion of natural gas as marine fuel in the Iberian Peninsula, a region that has experienced great growth in the adoption of clean energy mobility. In this extremely encouraging scenario, AltFuels Iberia 2019 will take place on 11-14 June at IFEMA Trade Center, Madrid. It will be an event consisting of first level conferences and exhibition of vehicles of all kinds, refueling stations, components, plants, road and marine engines, as well as the entire universe of the alternative fuels industry with the latest technological developments, multiple options for networking, business and new advances. For more information, please contact info@altfuelsiberia.com.